Just one cookie and the simplest of ingredients. This recipe is ridiculously easy. I will not be held responsible if this becomes a daily addiction! Allow your kids to try this recipe. Please take note that the mug and contents will be very hot so do supervise kids. Mix all ingredients well, pour in a microwave-proof cup and microwave for about 40-60 seconds in a cup. 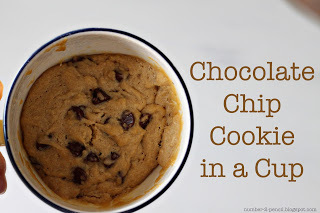 This is a gooey cookie recipe so it will be a bit soft but you can add another 20 seconds in the microwave if you want. Serve with a dollop of ice cream or enjoy on it’s own and wash it down with a mug of coffee. Or even cold milk. Previous What so fair about being fair? Mmm brilliant idea, I would love that with a large scoop if ice cream on top!